I have fond memories of being part of the Girl Guides as a child. Their motto was “be prepared” and I think they would be proud of the travel first aid kit I’ve assembled! I have been scouring posts on the ‘best family first aid kit’, and ‘baby emergency kit’ and have created what I think is the ULTIMATE children’s medical kit. There is nothing worse than being sick on vacation (oh wait, yes it’s having your kids sick on vacation!) so I hope that this first aid kit will help to keep everyone safe and in good spirits on vacation. I don’t have a first aid kit bag, but after removing all the packaging I’m able to fit ALL OF THIS into a diaper wipes container, a small ziplock, and a pill sorter. There hasn’t been a vacation yet where I haven’t used at least one or two items so I am happy to use up space for this family first aid kit. Miralax/Restoralax: Fitting that this is #1 on my list, because restoralax is an important part of my first aid kit. I know that most people worry about traveler’s diarrhea on vacation, but traveler’s constipation is a real thing! Restoralax is safe for kids (modify the dose by weight) and if given at the right dose isn’t going to cause any bathroom emergencies! Hydralyte: This is a recent addition to my travel first aid kit, and an important one. On a recent trip to Costa Rica, my Dad was thankful I had this when he came down with the stomach flu. These are tabs that you can add to a water bottle to help with dehydration if you get sick on vacation. Great for kids too! Advil: I tend to buy the individual packs (linked here) and so I can divide them up and put them in all my different bags (carry on, toiletry bag, beach bag, car glove compartment, first aid kit etc). Tylenol: As with advil, I buy the individual packs! It’s so much more convenient for planes or when you are on day trips to just be able to throw a few packs of Advil or Tylenol in your backpack. Oragel: I get canker sores, and there is nothing more annoying than a canker sore on vacation. Believe me, The q-tip applicators are easy to use and convenient. Yeast treatment: Again, this might not be something you think of for your first aid kit, but it is so important! No one wants to deal with a yeast infection on vacation, so be prepared! Also, the cream is great for bad diaper infections! Vapolypse: A eucalyptus vapor patch is great for my little ones if they get congested. They don’t want me to rub anything *ON* them but a sticker on their pajamas seems like fun! Gauze and Polyspirin: You never know what boo-boos might occur on your adventure. Zincofax spray: this product is a GAME-CHANGER. I am in love with this stuff. The worst part about applying diaper cream is getting it all over your fingers, enter Zincofax spray! I use this everyday and its a must for vacations where quick changes are the norm. Purell Hand Sanitizer: Ok so I am going to let you know a SECRET first aid hack. Purell hand sanitizer is the ultimate mosquito after bite. Apply it immediately after getting bitten and you will not notice your bites. Try it, it’s amazing! Boogie Wipes: soft on the nose, my son loves these! Nasal Aspirator: There is NOTHING more satisfying in the world than sucking boogers out with this thing, NOTHING! Immodium: Traveller’s diarrhea is no fun. Sometimes you have to let it run it’s course. However, if you have a bus, or plane to catch immodium at least helps to get you through your day. Gravol (Canada)/Dramamine(USA): For planes, boats, cars this is a must. I get the suppository kind for my children because if nothing is staying down, the meds aren’t either! 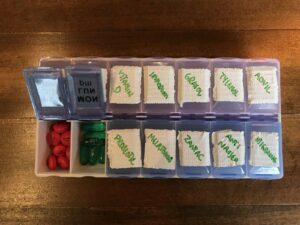 It can be a pain to travel with so many different pills and packages so I used a pill sorter that I had lying around the house to create a custom travel pill container. I used white duct tape and a permanent marker to label each compartment. It doesn’t need to be pretty, just functional! This makes it so easy to find what you are looking for. I suggest making one for the car to always have on hand as well! Packing the first aid kit is easy. 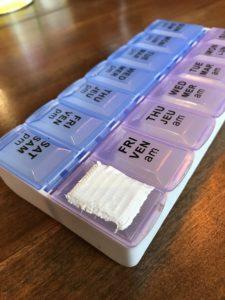 I used an old wipes container for the larger items, a pill sorter for any pills, and a ziplock bag for anything that I wanted to bring with me on the plane. Super simple and compact. The only items missing from the kit are the Zantac cream and the Boogie wipes because these go in my diaper bag. Voila! 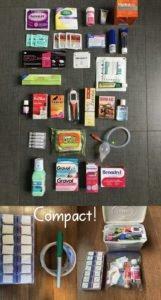 A travel first aid kit that is prepared for anything! Happy travels everyone! Do you want the first aid kit list as a PDF? Grab the link to the PDF in my family packing post! « Toddler Travel Gear: 10 essentials you don’t want to forget!